Why are liberals so intolerant and prone to violence? The controversial Colorado billboard depicting President Obama as a suicide bomber, gangster, Mexican bandit and a gay man has been taken down -- just days after the sign was erected and slammed nationwide for being racist. A local Tea Party group had planned to rally around the sign in Grand Junction on Friday, but when they arrived, it had been taken down. Those who know the owner of the billboard told a local NBC News affiliate that he and his wife were receiving death threats. The person who commissioned the piece is not yet known. Friends of the owner said he decided to take down the billboard because he was receiving harassing calls. "He got a lot of calls out of his place of business that he said he was fine with. When things got out of hand and people started calling his wife, that's when he decided to go ahead and take it down," said Blake Brueggeman, owner of Integrity Auto. Brueggeman leases property from sign's owner. The artist, Paul Snover, who was paid $500 for the artwork, also received hate mail and threats. He told local newspaper, The Daily Sentinel, that he hoped it would travel to other cities after the November midterm elections. 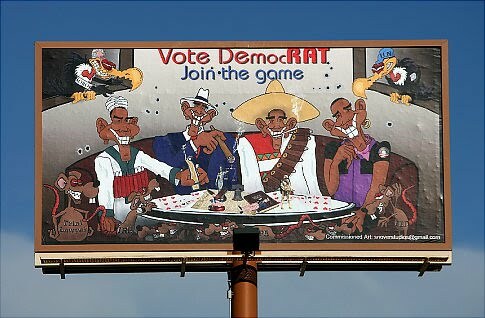 On the billboard, four cartoonish Obamas are playing poker, surrounded by rats with words written on them such as Trial Lawyer and IRS. Two vultures are depicted bearing tags that say Soros and U.N.
Across the top is written "Vote DemocRAT, Join the game." Maybe it's just me, but I don't see how the bilboard is racist. Perhaps some enlightened liberals can clue us in. If it's so horrifying and racist, why are newspapers publishing the photo of it? I recall George W. Bush being caricatured in every possible vulgar way. Why was that acceptable and goofing on Obama isn't?